One of the most memorable passages in Animal Liberation is about the animal research done by Harry Harlow and Stephen Suomi in the 1950s. 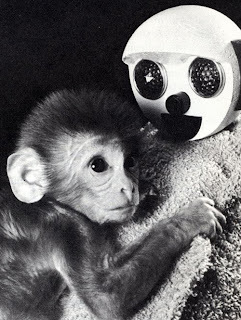 The two used rhesus monkeys to investigate maternal attachment, maternal deprivation, and depression. Of course, their real concern was about these phenomena in human beings, but they were using animals as a "model." Reason: you could do things to animals in a controlled lab setting that would be completely horrendous if done to human beings. The first of these monsters was a cloth monkey mother who, upon schedule or demand, would eject high-pressure compressed air. It would blow the animal’s skin practically off its body. What did the baby monkey do? It simply clung tighter and tighter to the mother, because a frightened infant clings to its mother at all costs. We did not achieve any psychopathology. However, we did not give up. We built another surrogate monster mother that would rock so violently that the baby’s head and teeth would rattle. All the baby did was cling tighter and tighter to the surrogate. The third monster we built had an embedded wire frame within its body which would spring forward and eject the infant from its ventral service. The infant would subsequently pick itself off the floor, wait for the frame to return into the cloth body, and then cling again to the surrogate. Finally, we built our porcupine mother. On command, this mother would eject sharp brass spikes over all over the ventral surface of its body. Although the infants were distressed by these pointed rebuffs, they simply waited until the spikes receded and then returned and clung to the mother. What Harlow and Suomi learned is that baby monkeys remain attached to very bad mothers. And then they inferred the same about human babies. By 1972, they'd come up with another way to induce and study depression. They had started placing baby monkeys in vertical stainless steel wells for up to 45 days. They learned that this produces "persistent psychopathology." So probably in people too. Harry Harlow died several years ago, but Stephen Suomi is alive and well. Is he an outcast now, living out his days in some retirement home for sadistic psychologists? In the back of my mind, I suppose I thought that must be true. This research is shameful because it was hideously cruel and didn't teach us things we couldn't have found out in less harmful ways. Surely the scientific community banishes people who fall so far short of ethical standards. Of all the evidence supporting the orchid-gene hypothesis[the subject of the article], perhaps the most compelling comes from the work of Stephen Suomi, a rhesus-monkey researcher who heads a sprawling complex of labs and monkey habitats in the Maryland countryside—the National Institutes of Health’s Laboratory of Comparative Ethology. For 41 years, first at the University of Wisconsin and then, beginning in 1983, in the Maryland lab the NIH built specifically for him, Suomi has been studying the roots of temperament and behavior in rhesus monkeys—which share about 95 percent of our DNA, a number exceeded only in apes. You can read the article and consider whether this is research that really serves a vital purpose. But I have to say that it saddens me to see Suomi's earlier efforts so richly rewarded. The zeitgeist about animal research has changed so much in 40 years. We're all products of our times. Hey I love the blog. I've been looking for more information on Commercial Mortgage Refinance and I was wondering if you have any good tips or pointers? I'm getting ready to move and I need all the information I can get. Thanks!